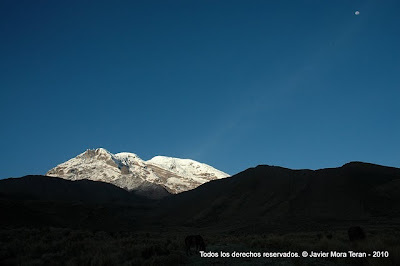 Chimborazo is the highest mountain in Ecuador. Due to its majestic and giant size it has always represented a symbol of overwhelming grandeur for foreign visitors. Humboldt believed it to be the highest mountain on earth and attempted in 1802 to climb it. Bolivar, the greatest hero in Latin America, was inspired by its imposing view and wrote a famous poem about the Chimborazo. Finally Edward Whymper together with the Carrel brothers reached the top in 1880. Climbing this mountain is a challenge for many experienced mountaineers. A good acclimatization and physical fitness is a must to succeed climbing this mountain. Located in the Vicuña nature reserve. Excellent views to the active volcanoes Tungurahua and Sangay. Accommodation in the refuge at 5000m. or campsite at 5100 m.
Estimated climbing hours: 8 – 9h. Ascent, 3 – 4h. Descent. Need of technical equipment and helmet.